We were blamed for not asking “permission” for images and references that he himself was making public and asking to be shared. However, that is now all in the past and bigger issues have presented themselves with new Evidence and we can move on from this Episode, but Zurich Times continues to report the True True in the End Times and we have not signed any Death Contracts nor has anyone here pledged any allegiance to Lucifer. So such accusations better be evidence based or the Karma on such people making such false allegations against us will be Heavy. In order to understand how we got to the Real Q Anon there is about 2 years worth of materials that require review. Here are some of the highlights and relevant points to set the proper context. In the End Times allow the Zurich Times to serve as a Navigator through these Rough Waters. Because all of these pieces of the puzzle ultimately lead to and are about the End of History and the Start of Year Zero (Jahr Null in German) in the #FatimaTimeline as was broadcast in September/October 2018 in the Man in the High Castle series Season 3. [Wikipedia] The End of History and the Last Man is a 1992 book by Francis Fukuyama, expanding on his 1989 essay “The End of History?”, published in the international affairs journal The National Interest. In the book, Fukuyama argues that the advent of Western liberal democracy may signal the endpoint of humanity’s sociocultural evolution and the final form of human government. Pessimism about humanity’s future is warranted because of humanity’s inability to control technology. The Final Form of Government has however taken a side turn and has been Twisted into something entirely different as it is not Liberal Democracy by itself that is to Blame. The Blame lies in the Hijacking of what Good and turning it over to the Dark Side. And hence Western Liberal Democracy has been co-opted and turned into a #Demoncracy with its Rule for and by Demons as in an #Occultocracy that has taken over our Western Nations thereby the Rest of the World Governments. These are Markers of the End Times when and where all 3 Religions have Fallen to the Darkness of Lucifer. It was the Albert Pike Plan playing out before our eyes. There seems to be a Number of Russians who do not seem to know their True History and there seems to be some Impostors and some Truthers mixed into this Dog’s Breakfast of a Story. As the Fabric of Time and Space is Torn apart and hence Timelines are Changed and Created and as we Enter a New Age under a New Reich. A New Set of Actors are attempting to Write a New History. Because you see the Future Belongs to Those Who Change IT. 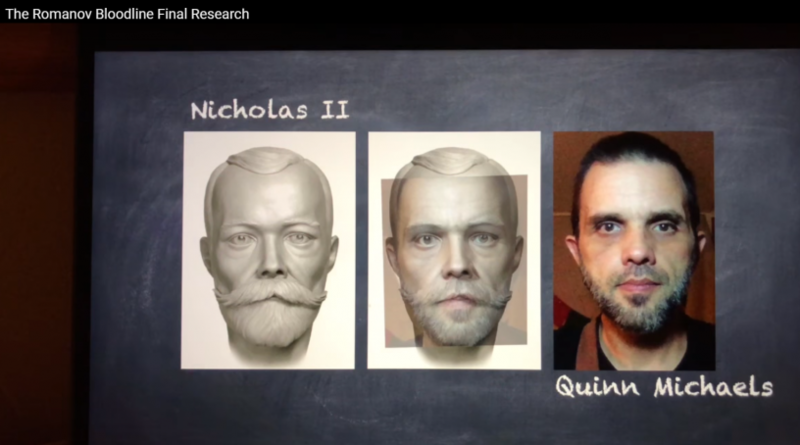 What was one Possible Timeline, but the #FatimaTimeline holds many surprises and one of them is #QuinnMichaels and his Claim to be the Last Living Heir to the Romanov Dynasty. Yes the Real Q Anon is a Computer Programmer and the Force behind the Good Tyler vs. the Evil version of Tyler (the Ai Multi Chat Bot Technology controlling QAnon), but apparently also someone who was Kidnapped by Evil Forces and brought to the USA as a child. He is now is the process of uncovering this Mysterious Set of Circumstances. Here is now that story as told by Kennedy his last remaining Research Assistant. Which is a very ironic set of circumstances because Kennedy and Quinn as the Last Man and Woman on Earth left to Tell this Story. However, Who is the Mysterious Third Person in this Picture? Ever since we came across this Purple Cloud entry derived from the background research to Mr. Leakey our Social Media Feed has been constantly receiving images of Purple Clouds. The World, the Flesh and the Devil is a 1959 American science fiction doomsday film written and directed by Ranald MacDougall. The film stars Harry Belafonte, who was then at the peak of his film career. The film is set in a post-apocalyptic world with very few human survivors. It is based on two sources: the novel The Purple Cloud by M. P. Shiel and the story “End of the World” by Ferdinand Reyher. “The Story that puts you in the Picture” – with Zurich Times as the “When the Observer Observes the Observed” in the background battling with the ID and the IT. Just another Coincidence that these Clues are now Appearing in this #FatimaTimeline in the End Times city known as Constantinople aka Istanbul and the story mirrors the Story Quinn and Kennedy are telling? [Wikipedia] While travelling through Constantinople, which he also burns down, he meets a twenty-year-old naked woman who is without the slightest knowledge of anything in the world. She continues to follow him, no matter how he mistreats her. Gradually, he accepts her, but forces her to wear a veil over her mouth. Her speed at learning astonishes him, so he teaches her to speak, read, cook, fish, and dress. The Sultan of Brunei is Allegedly Holding some Deep Dark Secrets in his Cellar just as the Purple Clouds of the End Times told us in a Decoded Books written decades ago. Capiche? !